It’s not hard to comprehend the far-reaching ramifications of this tool. Anytime you’re using an open Wi-Fi connection, anyone can swiftly access some of your most private, personal information and correspondence (i.e. 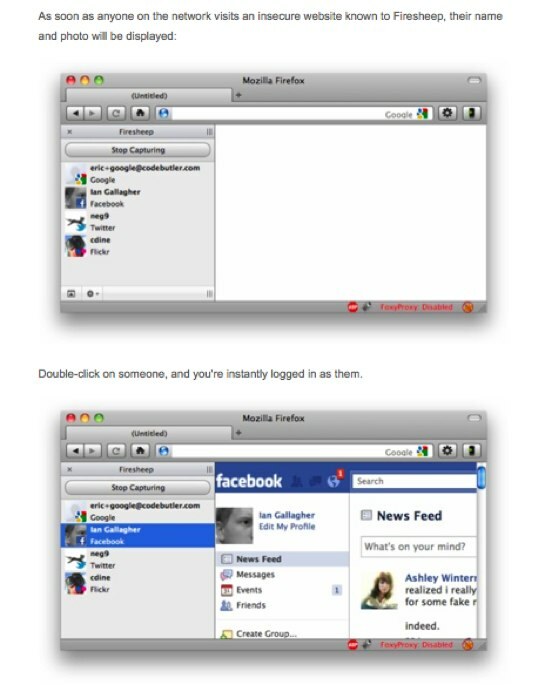 direct messages, Facebook mail/chat)— at the click of a button. And you will have no idea. This is how it works. If a site is not secure, it keeps track of you through a cookie (more formally referenced as a session) which contains identifying information for that website. The tool effectively grabs these cookies and lets you masquerade as the user. Apparently many social network sites are not secured, beyond the big two, Foursquare, Gowalla are also vulnerable. Moreover, to give you a sense of Firesheep’s scope, the extension is built to identify cookies from Amazon.com, Basecamp, bit.ly, Cisco, CNET, Dropbox, Enom, Evernote, Facebook, Flickr, Github, Google, HackerNews, Harvest, Windows Live, NY Times, Pivotal Tracker, Slicehost, tumblr, Twitter, WordPress, Yahoo, Yelp. And that’s just the default setting— anyone can write their own plugins, according to the post. (I had to pull one Tweet down at the request of the user, who had hacked into someone’s Twitter account). 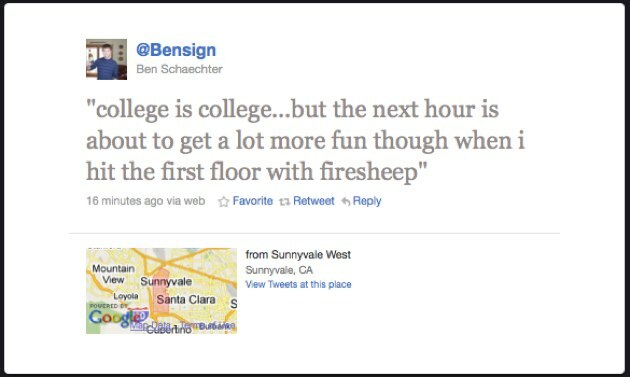 Thanks to Bensign, aka Ben Schaechter (former TechCrunch developer) for the tip. According to Butler’s post, he created this seemingly diabolical tool to expose the severe lack of security on the web. We spend so much time quibbling over the minutia in privacy policies, we lose sight of the forest, or in this case, gaping security holes. “Websites have a responsibility to protect the people who depend on their services. They’ve been ignoring this responsibility for too long, and it’s time for everyone to demand a more secure web. My hope is that Firesheep will help the users win,” Butler says. Update: A TechCrunch reader has discovered a Firefox extension that can prevent Firesheep from accessing your login information. Second Update: Here’s Facebook’s official statement on the matter:We have been making progress testing SSL access across Facebook and hope to provide it as an option in the coming months. As always, we advise people to use caution when sending or receiving information over unsecured Wi-Fi networks. This tip and others can be found on the Facebook Security Page. -Facebook logins are always encrypted (more info here: http://www.facebook.com/help/?faq=15504). -We offer a session control feature that allows people to view all of their active Facebook sessions (including those on unsecured networks) and close any they no longer want open. This helps if you forget to log out on another device or network. More info here.